A common management practice used to finish lambs is to house and feed lambs in an enclosed feedlot. Feedlots are used to protect the lambs from several environmental factors, predators, and parasites as well as ensuring the quality and amount of feed each lamb is receiving. Within the feedlot environment, variation in structural design and feedlot management is to be expected. As a producer, have you ever considered that maybe your feedlot flooring design and bedding material used could potentially affect the performance of your lambs? This is a question that the authors below were interested in. Therefore, their question of interest was; how does flooring and bedding type effect lamb growth, carcass characteristics, and visceral organ mass? In order determine this, two experiments were conducted. 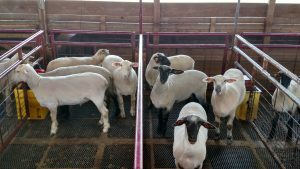 In Experiment 1, crossbred lambs were housed in a feedlot and placed either on expanded metal flooring, dirt with a sand top-dress, or dirt with straw bedding. Lambs in this experiment were fed a diet consisting of 80% concentrate and 20% forage. All ingredients, with the exception of whole shelled corn, were pelleted. 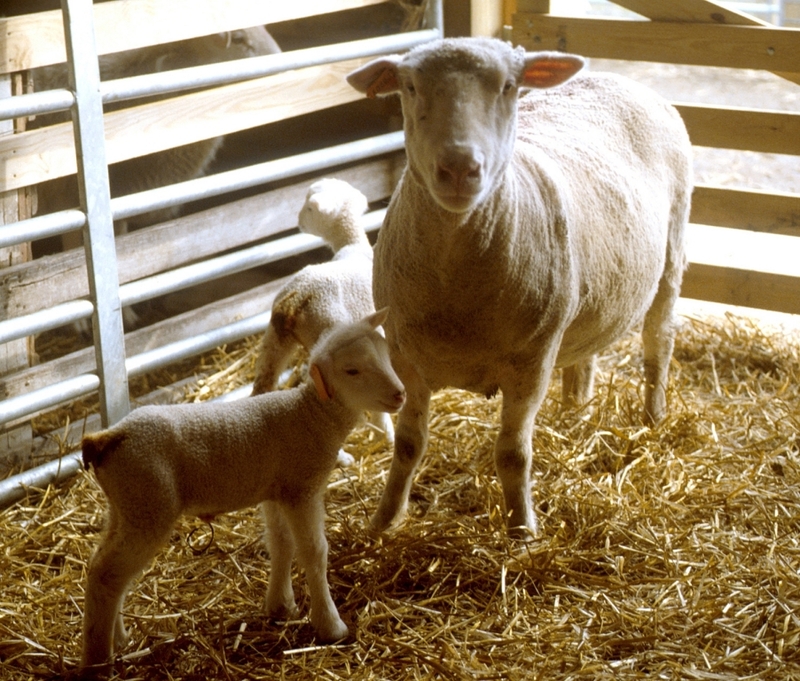 Lambs housed on expanded metal flooring consumed less feed (2.71 lbs./day), while lambs on straw bedding consumed the most feed (2.82 lbs./day) and lambs on sand bedding were intermediate (2.75 lbs./day). Lambs housed on expanded metal flooring had a lower average daily gain (ADG) when compared to lambs on straw bedding (0.57 vs. 0.62 lbs./day). No differences were seen in total DMI, total days on feed, and feed efficiency (lbs. of body weight gained/lbs. of feed consumed). As expected, lambs bedded with straw had a greater digestive tract weight when compared to lambs housed on expanded metal flooring. This is due to the increase in fiber these lambs received as a result of eating the straw bedding. An increase in digestive organ weight will also increase the energy required by the animal in order to maintain a larger digestive tract, resulting in less energy for muscle growth. There were no differences in lamb carcass characteristics due to flooring type or bedding material. In Experiment 2, crossbred lambs were housed in a feedlot and placed on either dirt with a sand top-dress or dirt with straw bedding. This experiment consisted of two phases, a growing phase and finishing phase. Lambs were provided a diet primarily consisting of alfalfa haylage during the growing phase and a high concentrate diet during the finishing phase. During the growing phase, lambs bedded with straw when compared to lambs bedded with sand had greater ADG (0.42 vs. 0.32 lbs./day), DMI (2.63 vs. 2.46 lbs. /day), and feed efficiency (0.34 vs. 0.29 lb./lb.). During the finishing phase, lambs bedded with sand had a greater feed efficiency compared to lambs bedded with straw (0.45 vs. 0.41 lb./lb.). Overall, both experiments show that when bedded with straw, lambs tend to increase DMI and have an increase in digestive tract weight. From a welfare perspective, straw can also be an effective type of environmental enrichment as it allows for feedlot lambs to perform natural behaviors such as rumination to break down the long stemmed forage. Along with an increase in digestive tract weight, more maintenance energy is required. Therefore, lambs that are provided with sand bedding may be more efficient in producing lean muscle mass as sand bedded lambs require lower maintenance energy. 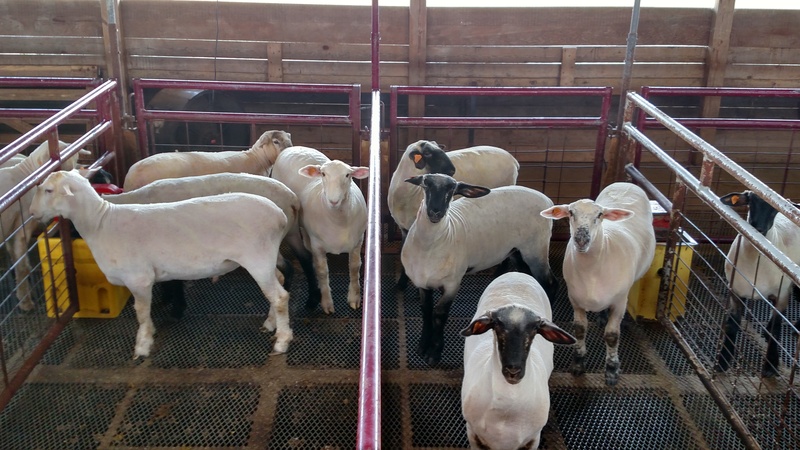 However, lambs that were housed in straw bedded pens demonstrated better growth parameters when compared to both sand bedding and expanded metal floors. Jaborek, J. R., G. D. Lowe, and F. L. Fluharty. 2016. Effects of pen flooring type and bedding on lamb growth and carcass characteristics. Small Rumin. Res. 144: 28-34. Posted by Braden Campbell at 8:00am January 4, 2019 Posted in Management, Research and tagged Management, Research. Bookmark the permalink.